Viewed by Larry Gleeson as part of the American Film Institute’s 2018 AFI DOCS. The Providers, recently selected for the AFI Impact Lab was directed, produced and photographed by Laura Green and Anna Moot-Levin. Green and Moot-Levin follow the movements and activities of Matt Probst, Chris Ruge and Leslie Hayes, three health care providers working for a small network of clinics, El Centro, in north-central New Mexico. El Centro clinics cover an area of 22,000 square miles and treats all patients regardless of insurance, condition or ability to pay. This area is in the top five for heroin overdoses in the United States. Moreover, approximately 70,000 deaths occurred last year in rural areas due to a lack of health care access – ten times the number of deaths in the Iraq and Afghanistan wars combined. After introducing the three characters, The Providers kicks into high gear, as Green and Moot-Levin begin capturing footage of the medical workers as they treat their patients and deal with their own individual life issues on life’s terms. Probst’s father, an opioid addict dies and his sister is arrested for buying drugs with monies fraudulently obtained via identity theft with a gang of five. Ruge receives a letter indicating his Echo Care funding will probably not be renewed and struggles with an imbalance between his obsession for work and a wife at home. Meanwhile, while Dr. Hayes continues to manage her workload quite well and worries what will happen if the Echo Care funding dries up. In addition to the work these three “country doctors” perform, each one has an extraordinary backstory and history that not only informs them but also inspires them to keep providing care to their own community that is so absent in far too many communities across the land. Green and Moot-Levin provide sharp cinematography and make effective use of traditional documentary filmmaking techniques with testimonials, voice-over narration, still photography, text overlays and non-diagetic music. Paul Brill provides a mesmerizing musical score and sound composition and the cinematography provided by Green and Moot-Levin is exquisite. Most importantly, the narrative is quite compelling as the protagonists make life a little brighter, a little better and a lot more hopeful for those they care for. Matt Probst, a physician’s assistant, serves as the Director of El Centro and laments to a group of recruits that by the end of the summer El Centro will have a shortage of eight positions. Chris Ruge, a former truck driver who wanted to feel more connected, is a nurse practitioner and has been funded for one year through a pilot program called Echo Care which allows Ruge to visit the sickest individuals in the region 24 hours a day. Leslie Hayes is a family doctor who treats her patients with compassion as they struggle with everyday, real-life problems and was in the first training session for treating opioid addiction in a primary practice. Dr. Hayes was recognized by the White House as a Champions of Change for her work in advancing the treatment, prevention and recovery for the opiate-addicted. 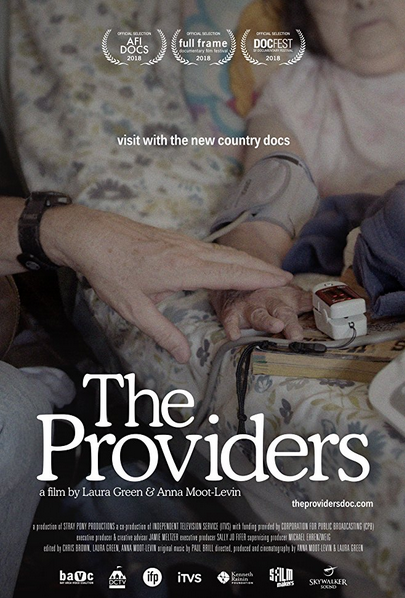 One thing becomes tantalizingly clear by the film’s end, The Providers is a heart-warming, soul-affirming documentary and it provides a deep insight into small-town America while confronting the challenges of keeping those in poor, rural communities safe. Warmly recommended with a run-time of an hour and twenty-four minutes. I Really enjoyed the review. After reading your review I want to watch the documentary exspealy how you said it was so heartwarming. I liked how there were a lot of number facts in the review too and numbers I feel like always put things into a good perspective. I think it great what they do up there and how they help no matter if you have insucce or not. I just watched Sicko and It was crazy how many people can not arrod help or treatment in the US. I like how you describe the cinematography and narrative as well. In this review The Providers Green and Moot Levin, written by Larry Gleeson, this review, this review discusses so many interesting topics that I found very interesting in regards to drugs, healthcare. How important health care is to the individuals. Especially people that have economic issues, how individuals can go through a lot such as even dealing with the war situations. There are a million people without health care in this world that have issues, even end up losing their life due to not having the resources to have health care. People that have life threatening illnesses, or end up in the hospital for drug overdose end up not being taken care of. This review is really eye opening and opens up our hearts that there are people out there that can provide for other, without some sort of interest. For the world and community not to be selfish and to help those that are underprivileged than us, especially the poor. Help them move into rural communities so that they have better life opportunities and re taken care of. Wonderful review Gleeson, it was really touching. This review on The Providers explained to me what the film is about and what to expect. The film is about what people have to deal with when having problems with healthcare in north-central Mexico. Story was well described in this review. I do believe that there were some exquisite cinematography in this film. The struggles people go through in this film with the doctors are a big part of the story. This documentary is well worth watching. I really enjoyed reading this review. This review brought a lot of light to aspects of the movie that I had not realized yet. For example, I had realized that there was an issue withdrugs in the family, but I did not make the connection of how useless Probst probably felt when it came to his family. Probst’s job was to help people in need, including one’s who were involved with drugs. However, when it came to his own family, there was nothing he could really do to help them. I feel as if the lighting and the mise en scene were extremely complementing to the overalll mood in the movie, and helped establish the setting as well.